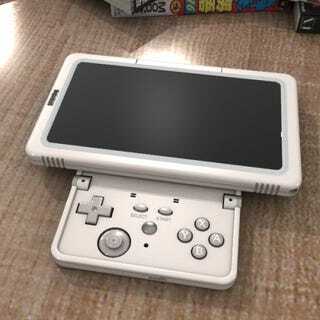 Is This The Best Nintendo 3DS Mockup We've Seen, Or The Real Thing? If this wonderful little piece of machinery isn't Nintendo's 3DS, slated to be revealed at E3 later this year, then we damn sure wish it was. Check out the sliding, twisting marvel in all its glory. The pictures come from a Japanese website called, as Google's translator indicates, Munch Blog, a site about anime, manga, games, and movies. The author says the pictures were posted without the manufacturer's permission, and that anyone not wishing to spoil the big reveal at E3 this year should look away. The device is fist shown as a small unit with one large screen, which threw us off at first. One screen? How could this possible be the 3DS, which should be dual-screened by name and nature? Soon it becomes clear. The one screen allows games to be played either on one large screen, or two simulated screens, ensuring backwards compatibility with the normal DS. In fact, the person taking the pictures inserts a DS cart, the Japanese version of Super Robot Wars OG Saga: Endless Frontier (a personal favorite of mine), and shows off the various orientations the dual screens can be displayed in, along with a smoothing filter built into the unit. Other features of this little miracle include the ability to scan pictures, take pictures, composite 3D images over real backgrounds, and place objects in the user's hands, much like we've seen demonstrated with the PlayStation Move. He also demonstrates 3D pointing, which tracks the movement of the user's finger, including distance, to manipulate an object on screen. You can pick through the full article at the link below. Perhaps some of our Japanese readers can help us with the translation, seeing as Ashcraft is fast asleep right now. Of course, we don't know if this is the real thing or not, but wouldn't it be amazing if it were? So amazing, in my opinion, that this has to be a fake. We've contacted Nintendo for comment on the story, just in case. Update: "Nintendo does not comment on rumors and speculation."